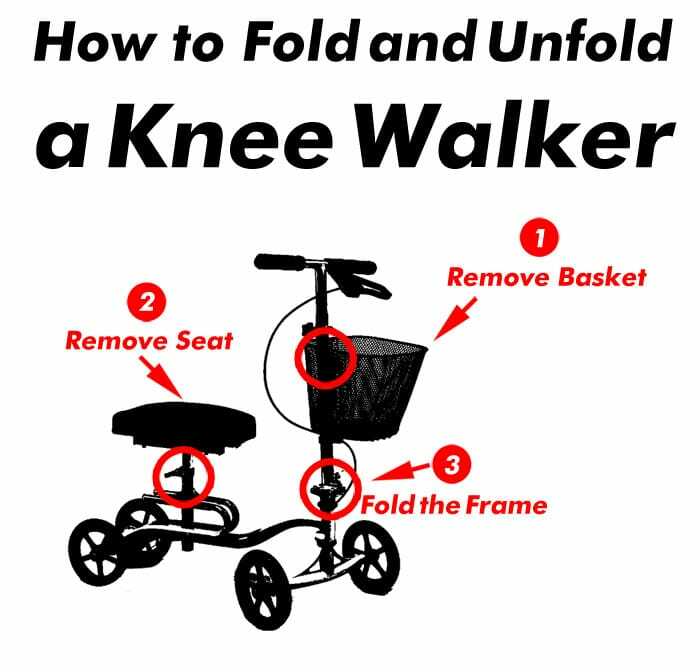 If you own a knee walker from Karman Healthcare, you should definitely know how to fold and unfold the device in case that you would like to store it somewhere and use it again at some point in the future. The first thing you want to do is remove the front basket to make it easier to fold the frame of the walker. You will need to pull up the basket from the 2 holding brackets to completely remove the storage basket. Once you remove the basket, you will need to remove the seat as well. To remove the seat you will need to remove the half circle pin below the seat by removing the pin from the half circle and sliding the pin out of the frame. Once the pin has been removed, you can remove the seat by loosening the quick release handle to the point where the seat can easily slide up and be removed completely. So at this point the front basket is removed as well as the seat, you can then loosen the quick release handle at the bottom of the handlebar tube on the front of the knee walker to release the tubing. You can remove the quick release mechanism from its locked state to begin to fold the frame of the walker. You want to push the handlebar tubing towards where the seat was placed before and it should allow you to completely fold the frame into a compact shape that is easy to store almost anywhere.